It’s just a quick adventure, but still a first. My birthday was Tuesday the 23rd, and I turned 38 for the first time (ok, that wasn’t it). My cousin Josh took me out for lunch, and I went to The Cheesecake Factory for the first time. 🙂 Delicious and good company! My initial draft of ideas for 52 adventures included “Document a day and its adventures in photos and reflections.” I decided my 37th birthday would be a good day to try. I enjoyed taking pictures–I felt like I was on a mission–but adding them into my blog was exhausting (I’m not all that tech-savvy) and diminished my desire to reflect on the day. Adventure completed, lesson learned. You can read about my day on my other blog. 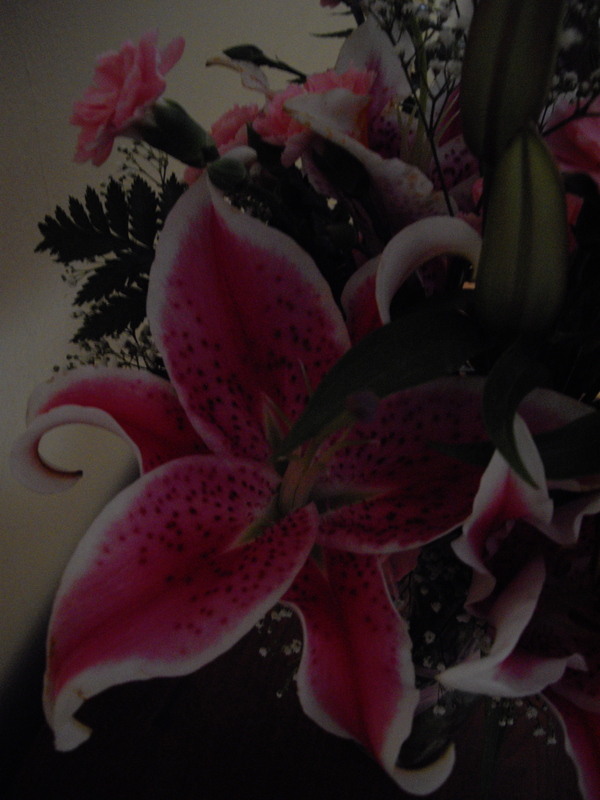 Those beautiful flowers were a birthday gift from my mother- and sister-in-law. Fresh flowers in my house make me oh-so-happy! After having so much fun during the classic horror movie marathon at Brattle Theatre, I kept looking for an adventurous reason to go back. That opportunity arose when they hosted a Q&A session with James Ivory from Merchant Ivory Productions. James Ivory directed the movie versions of both The Remains of the Day and Howards End. I’m not totally familiar with the process of making a film–I’m more of a book girl–so the talk was really informative. Everyone (myself–until recently–included) assumes he’s English, but he’s not. He finds this hilarious. Personally, I’d also like to live my life so that people assume I’m from England. He loved The Fantastic Mr. Fox, which reminded him of Ingmar Bergman’s The Magic Flute. He feels that small historical details can give a movie the richness and atmosphere it needs, and mentioned a fact he learned while doing research for Jefferson in Paris: whenever anyone paid a call to the court of Louis XIV and mentioned his name, all men present had to take off their hats… including Louis XIV. It’s always inspiring to be the presence of someone who is great at and passionate about their craft. Merchant Ivory Productions was headed up by a group of friends (a director, a producer, and a writer) who lived on different floors in the same apartment building, always ate breakfast together, and fought about and filmed great movies. Hearing him speak about that communal creative process was quite inspiring. I’ll definitely watch more of his films in the future. The Grape Excess Martini was a drink I discovered about 4 years ago at a former Boston hot spot – Excelsior. It’s the most refreshing drink and it packs a powerful punch! It’s light, fizzy, sweet but not syrupy, and has a special treat of frozen grapes threaded on toothpicks, so it’s sorta like having a snack with your alcohol! Stephanie, I am inspired. Years ago I had a drink in Milwaukee that was called “The Baron” It used Asbach Uralt, Tia Maria, and Galliano. Unfortunately I never got the ratios. For the last few nights I have been experimenting trying to find the right amounts of each ingredient. Unfortunately I have not yet found the magical combination that produces this little piece of heaven. But I am not giving up. On the upside I have been sleeping very well at night. The problem is you can only try so many till you kind of have to stop for the night. The first night I failed to write down what I tried, which has probably lead to some repeat failures. This weeks adventure may take more than a week. As part of my professional development, my manger suggested I attend a transformational education course called The Landmark Forum. Go ahead and Google it. You’ll think it’s a cult! It’s not, but the recruitment process and the drastic change that some people experience when they go through it is probably why it appears cultish. After three intense 12-hour days of rackets, vicious circles, completing my past, exploring possibilities, and committing to having an extraordinary life, I do feel transformed. I feel as though my perspective has shifted. My view of life is that the things that used to stress me out day in and day out are not that big of a deal. And when I encounter new problems, because I’m not bogged down with anxiety, I can clearly see the problem and solve it quickly and painlessly. I know many folks have strong opinions about wearing leggings as pants, but I decided to take a chance on virgin territory. I paired my black leggings with a short-sleeved black v-neck sweater and knee-high black boots. I wish I had been brave enough to take pictures, because I was rocking those leggings! Meghan, Spencer, AJ, and I went to see AJ’s brother’s band Muy Cansado at the Middle East. Although I wasn’t a fan of the bar (or being in grungy, hippie-filled Cambridge), the band was awesome! I get “itchy” if I spend too much time in Cambridge, so the highlight of the night, for me, was crossing the river into Boston to see DJ Matty D spinning at Foundation Lounge. I had a hard time visualizing what the deal was. Really needed pictures. I have been staring at anyone I see with leggings to figure out if I know what leggings really are. Unlike other wine regions, the Niagara Peninsula in Canada consistently undergoes freezing in winter, making it the world’s largest producer of Ice Wine. Every January, the region is transformed into a winter wonderland, and it celebrates one of Canada’s most cherished products in the Ice Wine Festival. Each winery features an ice wine and food pairing. Some of my favorites were the ice wine and cheese fondue, ice wine cupcakes, and Eskimo kisses (chocolate shells filled with Cabernet Franc Ice Wine). My roommate Meghann’s sister, Elizabeth, planned our wine adventure and managed to keep 10 twenty-somethings on track to visit 6 wineries in 5 hours. Even though the festival featured ice wine, each winery still had traditional tastings available for those who didn’t want to just drink the sweet ice wine. Elizabeth’s boyfriend Ben was knowledgeable about the region and made helpful recommendations for wines to purchase. Konzelman’s Winery was a great recommendation for reds and Jackson-Triggs had great whites. We finished off our night at the Casino, where I doubled my money on video blackjack. Too bad I only put in $10! In 2009, the company I work for aquired a biotech company in Montreal. The scientists were developing drugs that were complimentary to some of the drugs in our pipeline. As part of the integration process, my manager and I were sent to the site to present Orientation and Ethics and Code of Conduct training to the new employees. We were only there for one night, and had only a few short hours for sightseeing. The temperature was in the single digits, so walking around outside was uncomfortable for any length of time. I was briefly able to explore Old Montreal and the Old Port. My favorite part was the Basilique de Notre Dame in Old Montreal. I loved the gothic style church. It reminded me of the Cathedral de Notre Dame in Paris. The architectural influence in Montreal is clearly French, but it’s a more modern city than Paris. Montreal reminds me of Boston in the way that the old is mixed with the new. I’d love to get back during warmer weather to have more time to explore. My weekend of yoga and too much Downward Facing Dog led to painful spasms in my trapezius muscles. It’s a reoccurring injury, and I’ve been to physical therapy numerous times in the past 3 years. I wanted to try a different method to treat it. I read that people have experienced amazing results through Acupuncture, so I figured I would give it a try. The first part of my treatment consisted of needles stuck in various points such as my feet, hands, neck, back, and shoulders. After about 10 minutes with the needles, the acupuncturist asked me if I’ve ever had Moxa before. She explained that it was dried plant matter rolled into balls and placed on top of the needles. It was a technique used specifically to treat whiplash. It sounded a bit strange, but I wasn’t alarmed until the balls were placed on top of the needles and she proceeded to tell me that the next part of the treatment was to light the balls on fire! I was nervous about having flaming balls of plant matter on my back. I asked her how she knew the flaming plant matter would actually stay on the needles and not roll onto my back? She assured me that the treatment had been used and refined in the Japanese culture for hundreds of years. As bizarre as it sounds to place plant matter on top of needles and light it on fire, I have to say it worked! I only had one treatment so far, but already I have much less pain and soreness in my shoulders. Youre the one with the brains here. Im wacithng for your posts. I’ve always been a fan of yoga, so I thought what better why to spend a cold weekend in January than to go on a yoga retreat? I did some googling and was happy to find a yoga center only 2 hours from Boston – Kripalu Yoga and Meditation Center in Lenox, MA. The program I selected was “Relaxing into the Heart of Winter” with Jillian Pransky (pictured above). The program focused on restorative yoga, which is a type of yoga I had never tried before. The poses are supported by blankets, cushions, and foam blocks. They are held for longer periods of time than traditional yoga poses (15-20 minutes). The point of this process and meditation is to teach your body how to synchronize with the natural slowing down that happens in nature during the winter season. Kripalu is an old monastery, so the conditions are simple, but comfortable. The retreat was incredibly relaxing and allowed me to spend a lot of time being introspective. I treated myself to a spa package with a neck and shoulder massage, energy balancing, Vitamin C Facial, and an aromatherapy massage. I left the weekend feeling pampered, calm, and balanced. At the end of the retreat, we all drew “angel cards” out of a bag. Each card had a word on it. We were instructed to silently ask if there was anything the universe wanted us to know. I asked and the card that I drew was POWER. Hmm, I wonder what that means….